After 2 hectic days travelling to Bristol it was lovely to relax under the stars. With the telescope and eyepieces already set up in the observatory, I was up and running in a matter of minutes. It now takes me longer to put my cold weather clothes on than it does to setup. With the radio on, and a star filled eyepiece and a mug of tea I am in a wonderful place. After the obligatory start on the Orion Nebula, I moved further north to Hubble’s Variable Nebula, NGC 2261, in Monoceros. This fascinating object is illuminated by the star R Monocerotis (at the apex of the fan-shaped nebula in the sketch below). R Mon, perhaps due to dense clouds of dust nearby, changes in brightness. These changes in brightness then cause the nebula to brighten and dim over time. 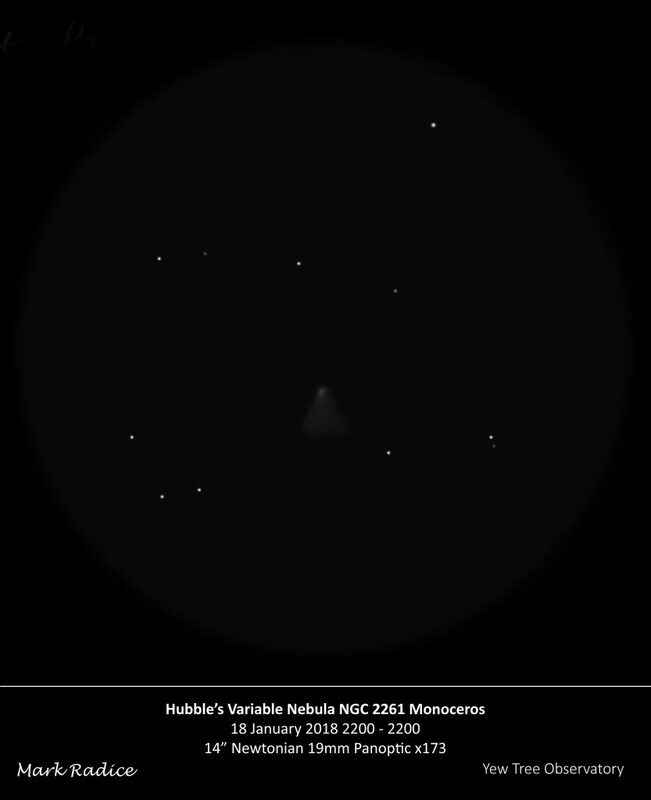 Normally nebulae are fixed, unchanged constants but this object is the exception to prove the rule. It is certainly an object to enjoy over time. I had meant to observe the (relatively) bright comet Heinze C/2017 T1. Unfortunately it was now behind the tree so this will have to wait. 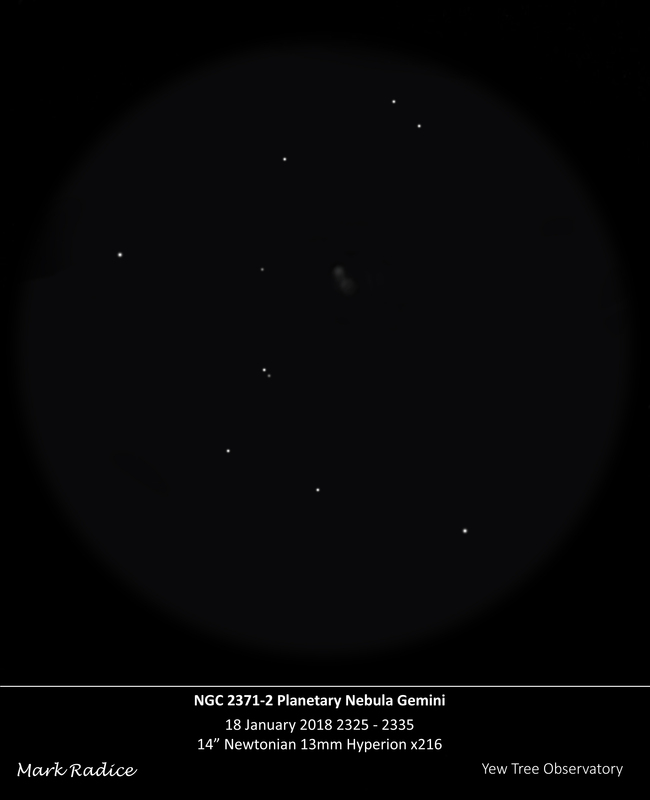 The next brightest comet is comet C/2016 R2 PANSTARRS in Taurus. After a star hop from Aldebaran and using Sky Safari to chart my way, I had the right area in the eyepiece. With careful scrutiny, I could, perhaps, make out a vague glow in the right place. It’s so faint, I don’t think I would have found it even if I had stumbled on it by chance. Comparing it to the faintest stars in the eyepiece, I would place the visual magnitude at around mag 13 – the faintest star I could make out was mag 13.9. With Gemini high overhead I could not resist finding my old friend, the twin double-lobed planetary nebula NGC2371-2. I first found this object at the Winter Star Party in 2015 when I was working my way through the Herschel 400. It is quite faint so I could not see it through the 100mm f5 refractor I was using but it was easily visible through a nearby 16” dob, owned by Bernie Poskus. He kindly let me take the time to observe this beautiful object. Now, each time I see this object I am reminded of observing in his company from the Florida Keys with palm trees overhead and stars reflecting in the sea. Unfortunately none of these features were apparent from my garden in Wiltshire. The telescope then moved on to some eye candy: the double star Castor shone like two headlights; the Eskimo nebula with its bright shell, bright core and central star and the exotic edge on galaxy M82, showing the central mottling and dark dust lane / notch. As it was now nearing midnight and my eyes were getting heavy, it was a simple task to put the dust covers back on and roll the roof back. No need to lug heavy equipment away. 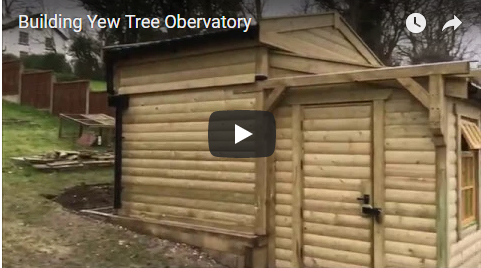 This observatory is definitely a keeper!